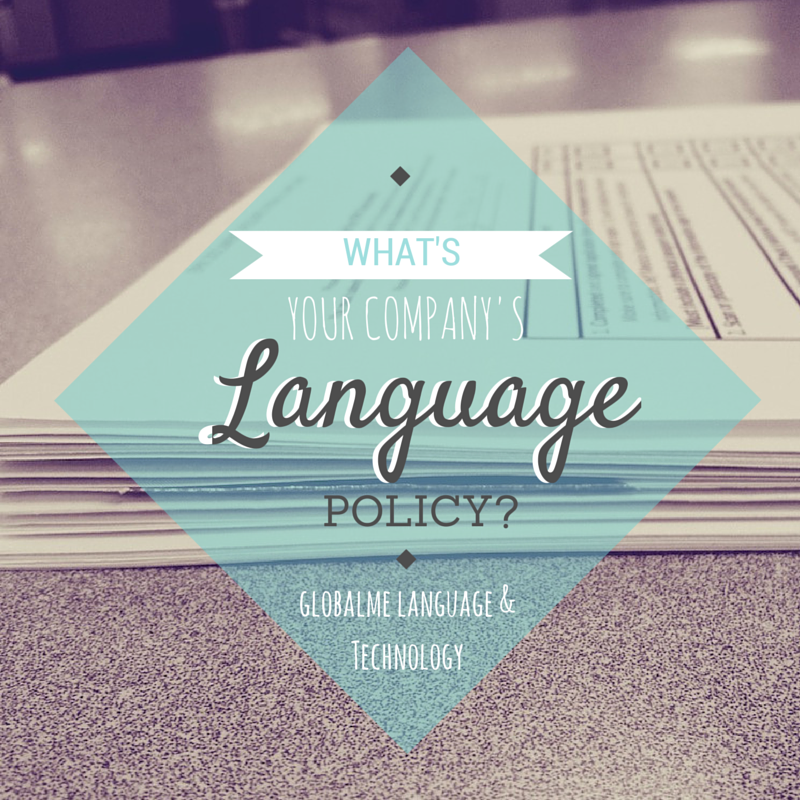 What's Your Company's Language Policy? What’s Your Company’s Language Policy? A company’s language policy can seem relatively straightforward at first glance, and writing it down might seem unnecessary. But especially if you’re running a company with employees in another country, where the native language is different from your own, the rules can quickly get confusing. Here’s an example: Your company, Bob’s Biscuits, started in the UK in 1986, was bought by a large Korean firm five years ago. The aforementioned biscuits are manufactured in India. So what language should your company speak, and when? Parent company language – The language your founders speak (or spoke, depending on the age of your company). Your archives are full of documents written in this language. Corporate language – Your CEO speaks this, and so does pretty much everyone at head office. Most of your communications are done in this language as well. Could be the same or different from your parent company’s language. Local languages – Do you do some manufacturing overseas? Handle call centre tasks in Southeast Asia? These are the languages routinely spoken by your foreign-based employees. Let’s look at the case of Bob’s Biscuits. English is pretty widely spoken in Korea and in India, so you might think the easiest solution is to operate exclusively in English. This isn’t an entirely bad idea; studies suggest that non-native speakers communicate well with other non-native speakers because they develop their own distinct rules for speaking, taking an encouraging stance and collaboratively building the conversation. So that should allow India and Korea to communicate with each other fairly well. But there are some disadvantages. You might need to institute language training for staff, which can be costly and time-consuming. You also have no absolute guarantee that your message is always coming through accurately, which can be worrying if you’re sending out important memos about policy changes, for example. One more disadvantage: By making head office the language authority, you’re placing them in a position of power, linguistically speaking. Your employees might feel more or less valuable based on their language proficiency. If you go further, and try to enforce a one-language policy in the workplace, you may even end up seriously damaging employee morale. The best advice here is to tread very, very carefully! Encouraging subsidiaries to operate in their local language can be very useful. You’ll have better access to the local market for your product, for one thing. You also make the workplace a very comfortable place for your employees, and make them better informed, especially if you produce eLearning or training in their language. Plus, it saves you the cost of language training. Some costs of this system: International partners visiting the site might need an interpreter. You’ll need a system for managing ongoing translations of documents and training programs that you distribute, which means, in our example, making sure all of your assets are clearly translated to English, Korean, and Punjabi. Other disadvantages are obvious – phone calls might be hard. You might also feel that there’s a cultural disconnect between the different sites. Language is culture, after all! With this policy, you allow each office to operate primarily in the local language, while using a mixed-language management team made up of expats and locals. There are some interesting upsides to doing business this way. Within the culture of your organization, it can build trust: When someone from outside arrives and makes honest attempts to speak your language, it’s a definite sign of good faith, which facilitates teamwork. It also lets you keep your competitive advantage in the local market, while still allowing on-the-ground communication with head office. The limitations of this strategy are in finding the resources. It’s wonderful to have multilingual employees, but it’s not easy to achieve. You need to identify people who are willing to relocate and learn intensively. So, going back to our example, maybe someone from the Seoul office who already is proficient in English can take some Punjabi lessons and spend some time with the manufacturing group. Other things to think about: Your local languages still play a major role, so you still need to manage translations on an ongoing basis. And you probably will also want to identify the primary language for official communication, just to make things as clear as possible. When you sit down to develop your own policy, you’ll probably find you need to incorporate elements of all three options, based on your needs. Just to give one example, many large companies (Microsoft, Intel, etc.) require English knowledge at their remote sites, but still translate corporate communications and trainings to local languages. For any company (even Bob’s Biscuits) there should be room for flexibility. 1. Make your policy responsive: Analyze your business, find out how language is already being used, and implement something that respects the reality of the situation, while still creating guidelines and efficiencies. 2. Formalize it: Write your policy down and make it clear to everyone in your organization. 3. Identify your language assets: Maintain a list of the multilinguals in your organization and leverage them to make communication easier. (Just don’t use them for translation!) Offer language training when you need to, and allocate resources for translation when it’s appropriate. 4. Update it: Revisit your policy periodically to make sure it still reflects the realities of your business. Done right, a corporate language policy can enrich your company’s culture and make communication easier. If you have some insights or experiences to share, please do so in the comments. Emily is a project manager at Globalme. She is also interested in usability testing and the user experience. Emily is on twitter at @emlrossi. Looking at CATs: SDL Trados Studio 2014Is Translation a Sad Profession?